Nothing can help you survive summer in the city quite like your dog. He trots next to you, adorable and fearless, all while making you seem more athletic, better-looking and nicer than you actually are. He's your steadfast companion in the urban jungle, and he's oh-so deserving of excursions beyond the dog park. And now it's easier than ever: Businesses and public spaces have never been more dog-friendly, and to help you navigate the cityscape, this June Purina will roll out a "Places for Pets" map that will showcase area restaurants, hotels and other attractions that gladly open their doors to dogs. Pet owners can pick up the map at area Schnucks stores beginning next month, or download it at STLPetLover.org. But first a word of warning: As Cyndi Burkard of Stray Rescue's vet clinic notes, dogs can suffer from the same summertime ailments that humans can, including sunburn, heat stroke and even skin cancer. 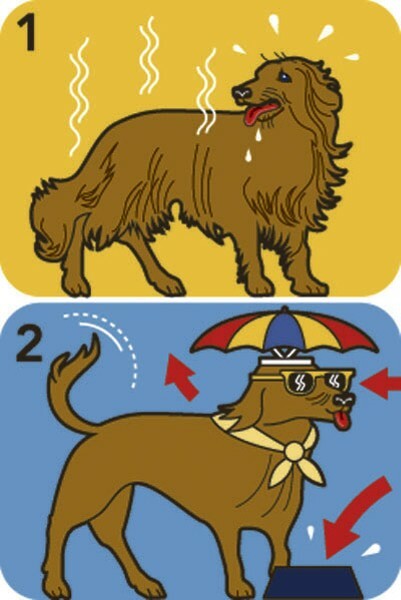 So you may want to refrain from some of the following activities during the hottest parts of the day. And if your dog experiences rapid panting or becomes overly lethargic, get her some water and shade ASAP. Now that we've dispensed with the precautions, here are some more activities to keep you and your pup entertained throughout the dog days of summer. Museum paintings of rolling landscapes and bowls of fruit are nice enough, but if your idea of beauty is a wet nose, a furry muzzle and a pair of adorable black eyes, the American Kennel Club Museum of the Dog (1721 South Mason Road, Town & Country; 314-821-3647), the world's only fine-arts museum dedicated to the canine, may be the ticket for you — and your pooch. Downstairs there's a hall of fame honoring notable dogs throughout history, such as Toto from The Wizard of Oz and the search-and-rescue dogs of 9/11, as well as a hat tip to St. Louis' own K-9 police units. Outside a spacious, fully fenced courtyard provides a nice off-leash respite for human and hound when it's time for a break. Visit www.museumofthedog.org for more details and upcoming events. Next, take your appreciation for the arts outdoors and hightail it to Laumeier Sculpture Park (12580 Rott Road, Sunset Hills; 314-615-5278), a vast, leafy expanse of more than 100 acres, accented here and there with striking large-scale artwork and a shaded 1.4-mile walking trail. Even though Laumeier's elaborate dog-centric exhibition by Finnish artist Tea Mäkipää's closed last fall, it lives on in the permanent piece Not Without My Dog. Located a few minutes from the trailhead, the work features models of dwellings — a pillared mansion, a cracked-window high-rise apartment, a fire-damaged trailer — that smaller dogs can poke around in and larger dogs will tower over. Mäkipää's description says it's a reflection of the hierarchies in the canine and human worlds, and the piece further seems to suggest that we're all just looking for shelter and a place to rest our weary legs, be it two or four. On Thursday, July 26, and again on Thursday, August 23, the park will host two "yappy hours" from 6 to 8 p.m. on the museum's terrace. Both evenings will feature live music, food, booths and demonstrations, as well as dog-sitting services, should guests want to check out the indoor exhibits. If you see no need to get highbrow with your hound, at least consider drinking some hooch with your pooch at the Shanti (825 Allen Avenue; 314-241-4772) in Soulard, which just might be the city's most dog-friendly bar. "On Saturday afternoons this place is dog central," reports regular Tom Kuehnle while kicked back on the brick-lined patio with his wife and his red Akita mix, Max. Buckets of water are always available for dogs — who are welcome inside and out — and humans can take advantage of happy-hour specials including all domestic beers for $2, well drinks for $2.50 and draft import bottles for $3.50, Monday through Friday from 4 to 7 p.m. And if your dog happens to be a night owl, another happy hour kicks off at 11 p.m.
Are you so similar to your dog that people do a double take when the two of you walk down the street? Maybe you've noticed that your schnauzer's 'stache seems sort of...familiar...when you see yourself in the mirror? If that's the case, you and your doggy doppelgänger are the perfect candidates for Purina's Dog Owner Look-Alike Day at the Incredible Dog Arena at Purina Farms (200 Checkerboard Loop; Gray Summit) from 2 to 4 p.m. on Sunday, August 26. Besides bragging rights, the winning pair will get a $25 gift card to the gift shop at Purina Farms and a year's supply of Purina pet food. Contact purinafarms@purina.nestle.com for more information, or call 314-982-3232 by August 25 to register. Finally, if you've always wanted to be a "dog person" but don't yet have one to call your own, get to the Purina Event Center for its International Cheese, Wine & Canine Festival on Saturday, June 9, at 6 p.m. At this 21-and-up soiree, you'll get to love on more than three dozen dog breeds and quiz experts to see which one best suits your lifestyle, whether it's a sassy Chihuahua or a mellow Saint Bernard. Your ticket ($25 in advance, $35 at the door) nets ten wine samples, a wine glass, cheese, fruit and crackers, all while benefiting the Missouri Rhineland Kennel Club. They're available for purchase at 314-982-3232 or purinafarms@purina.nestle.com.